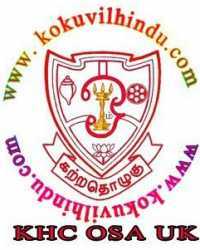 On 19th April 1992, a group of dedicated and enthusiastic old students, teachers and well wishers of Kokuvil Hindu College formed an old students’ association in the UK for the benefit of the College. 2.2. To bring together the past students, teachers and well-wishers of KHC living in the United Kingdom and provide a forum for the progression of friendship and cooperation amongst friends and families, and to offer an opportunity to build and maintain cultural relationships. 2.3. To establish and maintain liaison between the Association and the KHC for promoting better working relationship and improved information flow. 2.4. To work towards educational, cultural, sports, extracurricular activities and religious developments of KHC. 2.5. To establish close relationship and cooperation with Kokuvil Hindu College Old Students Associations of other countries. 2.6. To organize fund raising activities, and collect donations from members and well-wishers to give economic support for the development of KHC and its students. 2.7. To organize cultural functions, social gatherings, sports activities, discussion groups and tours without prejudice to the values of the KHC and the Association. 2.8. To function as a non-political and non-profit making organization. 2.9.1. To support financially with the funds specifically rose for it and without using the existing funds of KHCOSA (UK), for teaching English to the Primary Schools within KHC catchment area. 2.9.2. To raise funds and use them for financial support in Sri Lanka in case of natural disasters, poverty and other needy issues.